Look What I Did This Afternoon! 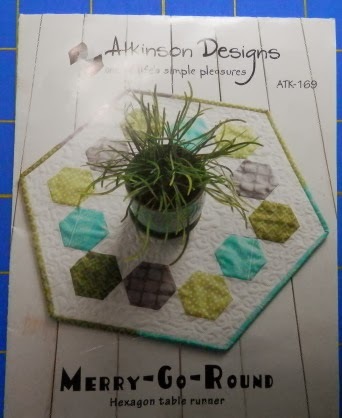 In yet another attempt to clean off my cutting island, I found this pattern and two fabrics that I had left from another hexie project. I also had the EZ Hexagon ruler and a Creative Grids 60 degree ruler. I chose to think of it as an omen. 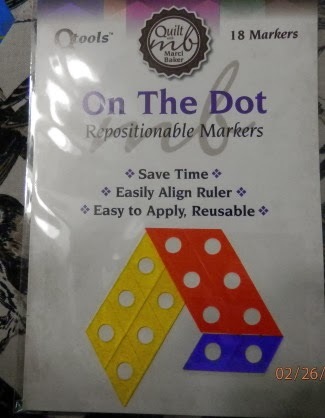 Several months ago, I had bought these On the Dot Markers. After attempting to fussy cut without them, I unearthed them from yet another pile of quilty goodness. What a difference they made! Here you see me (gasp!) 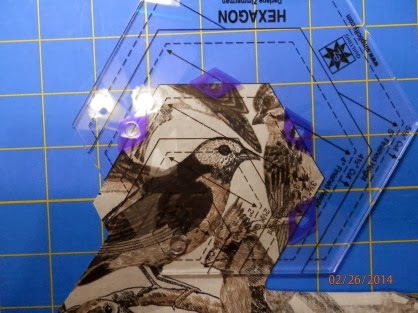 fussy cutting birds for this project. (I know--ME, fussy cutting?) 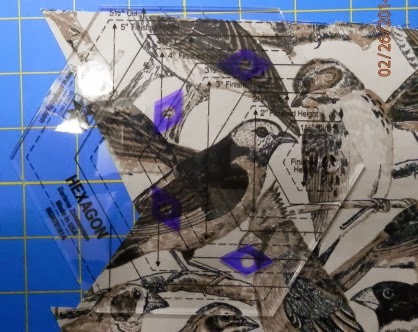 With the markers it is easy to see which lines I am using and to center the birds correctly. Now imagine this without the markers. Aligning for the second cut. And the third. Just so you know, Terry cut all the hexagons in the pattern from strips of fabric. No fussy cutting, and definitely faster. And no set-ins. But you know how I love me some fussy cutting.... And I love set-ins by hand! And here it is. From the start of the cutting to the borders, probably about 3 hours invested. All by machine. A close-up of one corner. What looks like an icky brown here, is, in fact, a very rich brown with even darker brown streaks. 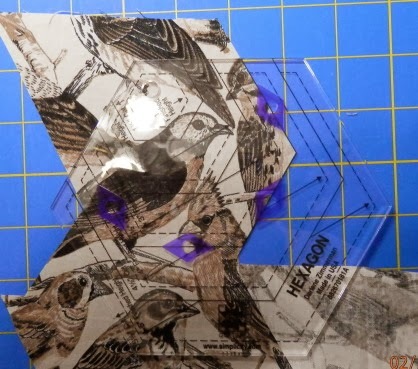 The bird fabric in the cutting pics is pretty true. And, yes, I probably did have something else I should have been doing, but I needed a "quilty-picker-upper" and this fit the bill. And the brown fabric--I have just a few very small pieces left. I was dangerously close to not having enough. But this was a project made strictly with what I had on hand. 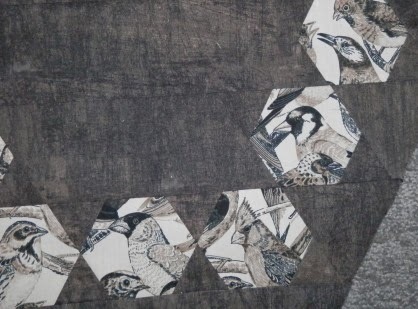 And I think I have enough bird fabric to back this. Binding? Okay, got me there--I'll have to look through my stash--or probably just go buy a quarter yard and be done with it! It's amazing what two days at home can do for productivity. I finished the hand stitching on two table runner bindings. One for me, one for my mom. Pieced by me, machine quilted by my friend Debbie. For Christmas, Debbie gave each of us a Connecting Threads kit for this table topper/wallhanging. The pattern is "Spice Cupboard" by This & That. All the fabrics for top, binding and backing were included in the kit, which was very generous on yardage. I made the top today! And...drum roll please...the top half of the Mariner's Compass is set together. I am taking another look at the bottom half just to be sure. The finish line is in sight. And...I have another small piece which I will show you next time that I pieced and machine quilted today. No grass grew under my feet today! 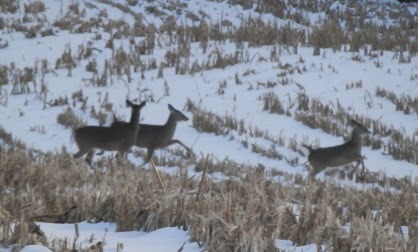 For your enjoyment...three deer frolicking in the snowy cornfield. That's it for tonight. Time to iron my shirt for tomorrow and travel to the Land of Nod. Stay warm (or cool). P.S. I finished listening to Dust by Patricia Cornwell, and Confessions, The Private School Murders by James Patterson. I am now listening to Mirage by Clive Cussler. Yes, I have taught at the Vermont Quilt Festival before--and in the ads I was "and more". This is the first ad in a national magazine for a national conference that actually features my name! Am I excited? YES!!!!! I spent some time today cleaning off the cutting island. It's a really bad sign when I can't get a 6 inch ruler onto a piece of fabric on the 24 x 36 inch cutting mat. I feel better and can't wait to get back to something more creative. P.S. I just finished listening to Cross My Heart by James Patterson and have just started Dust by Patricia Cornwell. 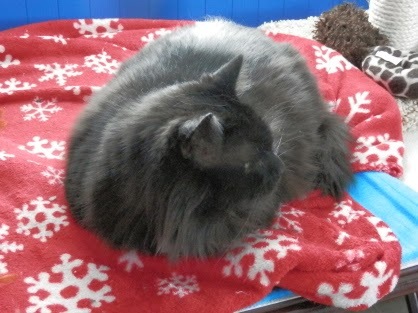 Dickens and I have had a day of hunkering down. Although a bit warmer (? ), the snow did its best to replace the bitter cold in our memories. That worked for several hours, but now the temperature is dropping, the wind is rising and the wind chills will again be in the negative degrees. I did the snowblowing late this afternoon and quite a bit of it has blown back in--but the good news was that the snowblower started right off and I "got 'er done". I am (still) working on the Mariner's Compass blocks. I am hopeful that I have only two or three four-inchers to go. Mostly fabric choice changes. But I see a definite end in sight. 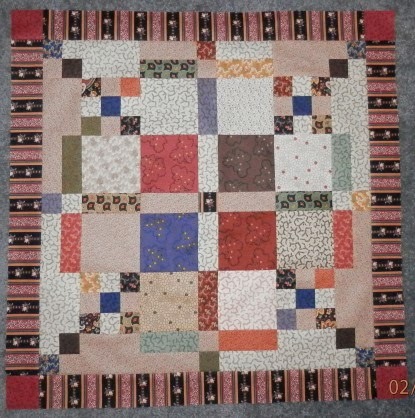 The hand-piecers at Quilters Corner in Ithaca are making significant progress on their Monthly Bliss 3 blocks. 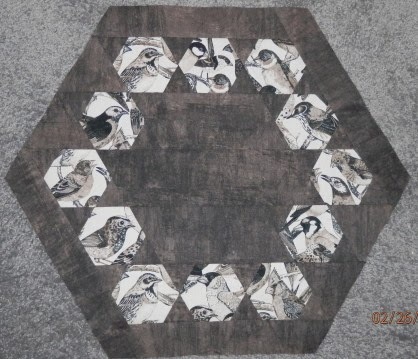 Several have never hand-pieced before but are bravely moving forward each month. I'll try to get pics next month so that you can see how truly beautiful these pieces will be. My posting has been spottier than I had hoped for 2014. Don't give up on me. If I ever decide to permanently stop blogging I will let you know. Someone reminded me over the weekend that she looks for a new blog post from me every day; that made me resolve to do better. So stay tuned--more compass pics coming soon! P.S. I am listening to Never Go Back by Lee Child (a Jack Reacher novel).